Right next door is Avondale, a Phoenix suburb with a strong Latin accent. 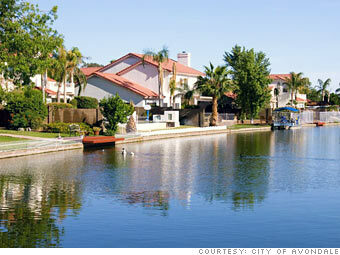 The community is nearly 50% Hispanic, and it draws people in search of affordable homes. Today, most sell for no more than $280,000, which buys a big four-bedroom house. There are foreclosures, sold as is, for as little as $26,000. There’s a golf course and ball fields here, plus wetlands on the banks of the Gila River, which hosts many species of birds. Day trip destinations include the Red Rock country around Sedona and the gorgeous deserts in and around Organ Pipe Cactus National Monument. Previous Post Arizona Housing Stats.